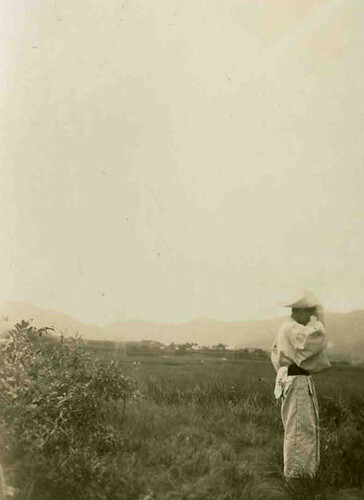 This photo is beautifully composed and balances interest between the man in his white kimono and the expansive fields and low mountain range in the background. The man appears to be wearing a western-style cowboy hat. This original old photograph is in fair condition with some warping, scratches, stains, fading and discoloration. The photo dates from the early to mid 20th century and was acquired in the historic city of Shizuoka, Japan near the foot of Mt. Fuji.